Unfortunately, in today’s world, chronic stress is becoming more commonplace. Coping with the pressure, tension, and worries of daily life can be difficult. If stress is not managed in a healthy, productive way, it can take a toll on your health, including your teeth and gums. Today, your general dentist in Lone Tree will discuss the types of oral health conditions that can develop due to stress and explain how patients can manage these issues. Metropolitan Dental Care has been serving our community for over three decades. No matter what your oral health concerns, our doctors can help you develop a personalized treatment plan to protect your smile. 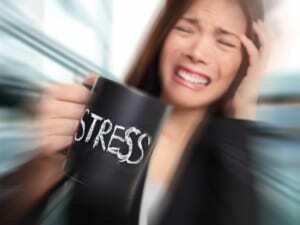 Stress can lead to a number of serious dental concerns. In the sections below, we will explore some of the most common conditions and discuss how to treat them. Tiny and white, canker sores can appear on the inside of the mouth. They may not look like much, but they can be a nuisance. Experts still aren’t sure exactly what causes them – but most doctors agree stress almost certainly plays a role. Canker sores could also be the result of bacteria, viruses, or your body’s immune response. Canker sores can be uncomfortable. The good news is, they typically go away on their own in about seven to 10 days. To reduce irritation in the meantime, steer clear of hot, spicy, or acidic foods. This includes things like salsa and citrus fruits. You can also purchase an over-the-counter numbing agent, such as Orajel® or Anbesol® to alleviate your discomfort. If canker sores are a regular occurrence for you, your general dentist in Lone Tree may prescribe a steroid ointment. Caused by the herpes simplex virus, cold sores – or fever blisters – can often appear when you are stressed or upset. Typically, these sores show up on or around the lips, although they can also develop around the chin or nose areas. Unlike canker sores, fever blisters can be spread to other individuals when you have an outbreak. Therefore, it is important to begin treatment as soon as you notice there is a problem. Generally, cold sores can be managed with prescription anti-viral drugs or over-the-counter remedies. Bruxism – or teeth grinding – can cause a tremendous amount of dental damage. Most patients who suffer from this condition notice their symptoms are exacerbated during times of stress. In addition to chronic jaw pain, bruxism can lead to enamel erosion, bite issues, tooth mobility, and more. Anyone who suffers from bruxism should wear a mouth guard to cushion their bite and protect their teeth from damage. Over-the-counter “boil and bite” mouth guards are available in the oral health aisle of every department store. However, custom oral appliances, available at our practice, are crafted to fit your unique anatomy, and can be much more comfortable than store-bought versions. Let’s face it – in times of stress, personal hygiene can sometimes take a backseat. If you are under a lot of pressure, it can be tempting to skimp on brushing and flossing or skip good dental habits altogether. The longer that plaque, tartar, and debris stay on the teeth, the greater your chances for developing serious oral health issues such as tooth decay and gum disease. Remind yourself that prevention is key. Remembering to brush and floss daily can keep you from needing costly, time-consuming dental work in the future. To maintain healthy teeth and gums, brush at least twice a day and floss once daily. Stress not only interferes with your quality of life, it also wreaks havoc on your health. To learn more about the effects of stress on your teeth and gums, schedule a consultation with your general dentist in Lone Tree. Our team at Metropolitan Dental Care can help identify the root cause of your issue and design a personalized treatment plan to address the problem. Proud to serve the communities of Denver, Lone Tree, Highlands, Ranch, Parker, and Centennial, we are well-equipped to provide high-quality dental care for the entire family. Contact us online or call us at 303-534-2626.